Brushing teeth, making coffee, unlocking a door – our brain is the central processing unit for many physical movements. This might make you think that without the brain, nothing would happen at all. But that’s not quite true. When a doctor uses a small hammer to tap our knee, we experience a reflexive kick of the lower leg. And when we accidentally touch a hot stovetop, our hand will jerk back immediately. It’s not the brain that’s responsible for such movements, but another part of the central nervous system: the spinal cord. A headless chicken is, albeit somewhat morbid, proof of the fact that a living creature is able to move without a brain. The chicken flaps and runs about for several seconds even after its head has been severed from the body. The Pleurobot by Auke Ijspeert and his team attracted particular attention. What at first glance looks like a paleontological skeleton assembly kit is actually a sophisticated reproduction of a salamander’s musculoskeletal system. Watching the Pleurobot, which is powered by 27 motors, move in water or on land leaves the observer in awe. The similarity to a salamander’s natural movement is remarkable. The Biorob team made every effort to design the Pleurobot to be as similar to a salamander as possible: They used 3D X-ray videos to analyze every limb of a salamander in motion. This was followed by meticulous mechanical and motor function calculations. It’s no coincidence that biomechanical research focuses on amphibians. Their locomotor system is interesting because it permits studying the gradual transition of movement on land and in water. Several years ago, neurobiologists were able to show that salamanders can be “remote controlled” by stimulating their spinal cord. Weak electrical stimulation lets the salamander walk; increasing the stimulus beyond a certain threshold results in the salamander performing its typical swimming movements. This ultimately means that the salamander’s brain is not fully in control of the locomotor system. In fact, the spinal cord and limbs form an almost autonomous control and locomotor system. “The brain merely has a stimulating function,” says Auke Ijspeert. The Pleurobot follows this functional principle: Transitioning from walking to swimming movements requires only an increase in the electrical current. “When we control the Pleurobot remotely, we don’t need to control each individual motor. Similar to the brain of a salamander, we only determine the direction, the speed, and the intensity of the stimulus.” The function of the spinal cord in the Pleurobot is assumed by a microcontroller which – put simply – has been programmed with mathematical models of a salamander’s spinal neural network. But why go to all this effort? “Our interest is to fundamentally understand how the nervous system in a spinal column functions,” explains Auke Ijspeert. It’s a very complex subject that has by no means been exhaustively researched. The spinal cord’s well-protected location in the canal of the vertebral column in particular makes it very difficult to measure its neuronal activity – even more so than the activity of the brain itself. 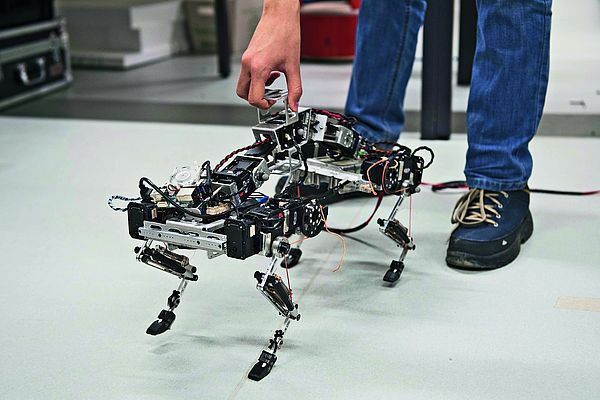 “You can’t just stick some electrodes into the spinal cord of a moving animal and measure what’s happening.” One reason why Auke Ijspeert likes this combination of biology and robotics is that other scientific disciplines benefit from it. A fundamental understanding of movement can help in the manufacture of neuroprosthetics, for example. Discoveries in the fields of neuronal systems and the spinal cord are incorporated into research work on new paraplegia therapies. With its Envirobot – a snake-like swimming robot – the EPFL team have also developed and built an inspection robot. It can be used to detect and measure water pollution, for example. To investigate the effects of competitive and non-competitive volleyball exercises on the functional performance and motor control of the upper limbs in chronic stroke survivors. Participants were randomly assigned to competitive (n=16) or non-competitive (n=16) volleyball exercise groups (60 min/day volleyball exercise + 30 min/day traditional rehabilitation, 3 day/week for 7 weeks) and control group (n=16). Reach and grasp motor control measures were evaluated through kinematic analysis. Functional outcomes were assessed via Motor Activity Log, Wolf Motor Function Test, Box and Block Test, as well as, Wrist Position Sense Test. Significant improvement of functional performance was observed in both competitive (P <0.0001) and non-competitive volleyball exercise groups (P <0.01), but not in the control group (P >0.05), with the exception of Wolf Motor Function Test score. Volleyball training, in general, resulted in more efficient spatiotemporal control of reach and grasp functions, as well as less dependence on feedback control as compared to the control group. Moreover, the competitive volleyball exercise group exhibited greater improvement in both functional performance and motor control levels. Volleyball team exercises, especially in a competitive format, resulted in enhancing the efficacy of the pre-programming and execution of reach and grasp movements, as well as a shift from feedback to feedforward control of the affected upper limb in chronic stroke survivors. This may well be a potential underlying mechanism for improving functional performance. 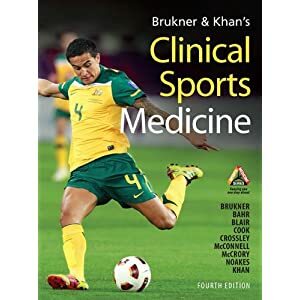 Motor Control / Muscle Activation / Motor Re-education, whatever you might want to call it — is one of the crucial keys to a successful rehabilitation program especially in sports medicine rehabilitation but is often times overlooked by many clinicians. What Happens After Injury and How it relates to Motor Control? Injury causes chemical pain and swelling, both of which have inhibitory effect on muscle’s ability to contract. Therefore, muscle conditioning or motor control must commence after initial injury along with pain and inflammation management. This process or treatment aims to teach the patient how to activate those muscles that are inhibited following an injury. For example, following a shoulder impingement injury, local stabilizers of the shoulder like the supraspinatus are inflamed and inhibited. Athletes or clients should be taught how to activate and control that damaged muscle before proceeding to other forms of muscle conditioning and/or strengthening. I have been blessed to grew up in a university and clinics which taughts and applies the practice of activating first the local stabilizers of the body is the first priority rather than taking theshortcut of activating global muscles thinking that if global muscles are activated so do the local stabilizers. But sadly, it is not always the case. I am devastated to see so many clinics trying to fire up global muscles without knowing if local stabilizers are right on point before firing their guns. It is important to differentiate what a global muscles and local muscles are. Global muscles are the large, torque-producing muscles, whereas local muscles are responsible for local stability. For example, in the shoulder region, global muscles are your deltoids & upper trapezius, while local muscles are your rotator cuff like supraspinatus and infraspinatus. In the recent years of study, there has been an increasing understanding of the important role of activating first the local stabilizers of the joint before the torque producing global muscles. When There is No Motor Control.. When there is no motor control, there is a incorrect motor patterning syndrome, especially after injury. How To Do Motor Control? Tips and Tricks. As I practice in clinics, I always use cuing and tactile / verbal feedback to facilitate control of desired movements. For me to feel if the right muscle is being activated I always palpate 2 groups of muscles. One is the muscle in which I want to control or facilitateand another are the groups of muscles which I do not want to be substituting during motor learning. I find this effective in facilitating motor control. Other techniques I use are visualization of the correct muscle action. Also, I often times demonstrate and describe the muscle action to the patient. One technique which I haven’t used yet because it is so time consuming, but I think will be more effective is to have anatomical illustrations of the muscles involved around what you want to monopolize. Use of instructions that cue the correct action also helps. For example, phrases like “pull your navel towards towards your spine” to facilitate control of transversus abdominis. One of the best advise that I would give is to focus on precision. The patient has to concentrate and focus on the precise muscle action to be achieved. It should be stressed that activation of the muscles should be a gentle action. Other muscles should remain relaxed during this localize exercise. I like to hear it from you. What are your thoughts on these? Do you agree or disagree? Prior reviews on the effects of anodal transcranial direct current stimulation (a-tDCS) have shown the effectiveness of a-tDCS on corticomotor excitability and motor function in healthy individuals but nonsignificant effect in subjects with stroke. To summarize and evaluate the evidence for the efficacy of a-tDCS in the treatment of upper limb motor impairment after stroke. A meta-analysis of randomized controlled trials that compared a-tDCS with placebo and change from baseline. A pooled analysis showed a significant increase in scores in favor of a-tDCS (standard mean difference [SMD]=0.40, 95% confidence interval [CI]=0.10–0.70, p=0.010, compared with baseline). A similar effect was observed between a-tDCS and sham (SMD=0.49, 95% CI=0.18–0.81, p=0.005). This meta-analysis of eight randomized placebo-controlled trials provides further evidence that a-tDCS may benefit motor function of the paretic upper limb in patients suffering from chronic stroke. Understanding upper limb impairment after stroke is essential to planning therapeutic efforts to restore function. However determining which upper limb impairment to treat and how is complex for two reasons: 1) the impairments are not static, i.e. as motor recovery proceeds, the type and nature of the impairments may change; therefore the treatment needs to evolve to target the impairment contributing to dysfunction at a given point in time. 2) multiple impairments may be present simultaneously, i.e., a patient may present with weakness of the arm and hand immediately after a stroke, which may not have resolved when spasticity sets in a few weeks or months later; hence there may be a layering of impairments over time making it difficult to decide what to treat first. The most useful way to understand how impairments contribute to upper limb dysfunction may be to examine them from the perspective of their functional consequences. There are three main functional consequences of impairments on upper limb function are: (1) learned nonuse, (2) learned bad-use, and (3) forgetting as determined by behavioral analysis of tasks. The impairments that contribute to each of these functional limitations are described. According to the International Classification of Functioning, Disability and Health model (ICF) (Geyh, Cieza et al. 2004), impairments may be described as (1) impairments of body function such as a significant deviation or loss in neuromusculoskeletal and movement related function related to joint mobility, muscle power, muscle tone and/or involuntary movements, or (2) impairment of body structures such as a significant deviation in structure of the nervous system or structures related to movement, for example the arm and/or hand. A stroke may lead to both types of impairments. Upper limb impairments after stroke are the cause of functional limitations with regard to use of the affected upper limb after stroke, so a clear understanding of the underlying impairments is necessary to provide appropriate treatment. However understanding upper limb impairments in any given patient is complex for two reasons: 1) the impairments are not static, i.e. as motor recovery proceeds, the type and nature of the impairments may change; therefore the treatment needs to evolve to target the impairment contributing to dysfunction at a given point in time. 2) multiple impairments may be present simultaneously, i.e., a patient may present with weakness of the arm and hand immediately after a stroke, which may not have resolved when spasticity sets in a few weeks or months later; hence there may be a layering of impairments over time making it difficult to decide what to treat first. It is useful to review the progression of motor recovery as described by Twitchell (Twitchell 1951) and Brunnstrom (Brunnstom 1956) to understand how impairments may be layered over time (Figure 1). Sequential progression of motor recovery as described by Twitchell and Brunstrumm. Note that while recovery is proceeding from one stage to the next, residual impairment from preceding stages may still be present leading to the layering of impairment. Also note the underlying physiological processes that may account for progression from one stage to the next. The majority of patients with partial or total loss of hand motor abilities, including those suffering from debilitating disorders like muscular dystrophy, amyotrophic lateral sclerosis (ALS), and incomplete spinal cord injury, experience greatly reduced quality of life due to their inability to perform many daily activities. Tasks often taken for granted by the able-bodied become frustrating and nearly impossible feats due to reduced gripping strength and motor control of the hand. [Abstract] Post-stroke spasticity management including a chosen physiotherapeutic methods and improvements in motor control – review of the current scientific evidence. Cerebrovascular diseases based on stroke etiology concern millions of people worldwide, and annual rates of disease are still increasing. In the era of an aging society and suffering from a number of risk factors, in particular those modifiable, strokes and muscles’ spastic paresis, subsequently resulting in damage of upper motor neuron structures will become a serious problem for the entire health care system. Effective management and physiotherapy treatment for post-stroke spasticity persisted, both in the acute and chronic, is still a significant medical problem in the interdisciplinary aspect. Care procedures for this type of patient becomes a kind of challenge for specialists in neurology, internal medicine, cardiology, dermatology or neurosurgery, but also for physiotherapists in their everyday clinical practice. The aim of this paper is to present the issues of cerebral stroke and resulting spastic hypertonia in terms of current pharmacological treatment and surgery, and primarily through the use of effective physiotherapy methods, the use of which was confirmed in the way of reliable scientific research in accordance with the principles of Evidence Based Medicine and Physiotherapy (EBMP). We summarize content from the opening thematic session of the 20th anniversary meeting for Biomechanics and Neural Control of Movement (BANCOM). Scientific discoveries from the past 20 years of research are covered, highlighting the impacts of rapid technological, computational, and financial growth on motor control research. We discuss spinal-level communication mechanisms, relationships between muscle structure and function, and direct cortical movement representations that can be decoded in the control of neuroprostheses. In addition to summarizing the rich scientific ideas shared during the session, we reflect on research infrastructure and capacity that contributed to progress in the field, and outline unresolved issues and remaining open questions. At the 20th anniversary meeting for Biomechanics and Neural Control of Movement (BANCOM), the opening thematic session was chaired by Dr. Fay Horak (Oregon Health & Science University). Presentations and discussions covered insights from 20 years of research in the field of motor control, delivered by Drs. Zev Rymer (Rehabilitation Institute of Chicago), Andy Biewener (Harvard University), Andy Schwartz (University of Pittsburgh), and Daofen Chen (National Institute of Neurological Disorders and Stroke). Presentation themes included the impact of technological advancements on motor control research, unresolved issues in muscle biology and neurophysiology, and changes in the scientific funding landscape. This brief review summarizes content presented by each speaker, along with discussions from the audience. 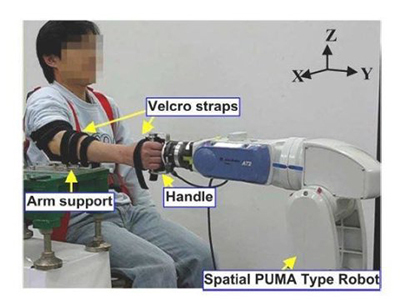 Scientists from Ulsan National Institute of Science and Technology (UNIST) have developed a new robotic tool to assess muscle overactivity and movement dysfunction in stroke survivors. They suggest, in a study published recently in IEEE Transactions on Neural Systems and Rehabilitation Engineering, that their robotic-assisted rehabilitation therapy may help improve the stroke patients’ mobility. The study was led by Professor Sang Hoon Kang of Mechanical, Aerospace and Nuclear Engineering at UNIST in collaboration with Professor Pyung-Hun Chang of DGIST and Dr Kyungbin Park of Samsung Electronics Co Ltd, according to a media release from UNIST. In their study, Kang and the others on the team developed a rehabilitation robotic system that quantitatively measures the 3 degrees-of-freedom (DOF) impedance of human forearm and wrist in minutes. Using their impedance estimation device, which they call the distal internal model based impedance control (dIMBIC)-based method, the team was able to accurately characterize the 3 DOF forearm and wrist impedance, including inertia, damping, and stiffness, for the first time, the release continues. The research team expects that, in the long run, the proposed 3 DOF impedance estimation may promote wrist and forearm motor control studies and complement the diagnosis of the alteration in wrist and forearm resistance post-stroke by providing objective impedance values including cross-coupled terms, the release concludes. The significant socioeconomic costs of stroke coupled with the rise in Europe’s ageing population highlights the need for effective but affordable stroke rehabilitation programmes. EU researchers made considerable headway in this regard through novel rehabilitation paradigms. Computer-mediated rehabilitation tools require a high degree of motor control and are therefore inadequate for patients with significant impairment in motor control. Consequently, many stroke survivors are unable to benefit. The REHABNET (REHABNET: Neuroscience based interactive systems for motor rehabilitation) project came up with an innovative approach to address this critical need. Researchers successfully developed a hybrid brain-computer interface (BCI)-virtual reality (VR) system that assesses user capability and dynamically adjusts its difficulty level. This motor imagery-based BCI system is tailored to meet the needs of patients using a VR environment for game training coupled with neurofeedback through multimodal sensing technologies. The game training scenarios address both cognitive and motor abilities. The four rehabilitation scenarios include bimanual motor training, dual motor cognitive-motor training and a simulated city for training on daily living activities. Pilot and longitudinal studies demonstrated the benefits of longitudinal VR training as compared to existing rehabilitation regimens. The self-report questionnaires also revealed a high user acceptance of the novel system. Designed for at-home use, the REHABNET toolset is platform-independent and freely available globally as an app (Reh@Mote). Besides deeper insight on factors affecting stroke recovery, this could aid in further improvement of rehabilitation strategies. More importantly, these low-cost toolsets could also address the needs of patients with severe motor and cognitive deficits. Efforts are ongoing to facilitate future commercial exploitation through a technology transfer agreement.